In the very next verse (Gen 1:2) we see that the “Spirit of God” hovering over the face of the waters. This is our first hint of the deity of the Holy Spirit in the Old Testament. We do not clearly see the Spirit of God as a distinct person from the Father and the Son till the New Testament but the revelation here in the second verse of the Bible is consistent with the New Testament’s testimony of the Holy Spirit. in the image of God he created him; male and female he created them.” The action of creating indicates the single being of God and the union of the will of the Godhead in the act of creating. In Genesis 19:24 we have two uses of the tetragrammaton (YHWH, יְהֹוָה), the proper name of God (Translated as LORD) used to show an interaction between the members of the Godhead. We see the LORD on the earth raining sulfur and fire from the LORD out of heaven. “Then the LORD rained on Sodom and Gomorrah sulfur and fire from the LORD out of heaven.” In just a few verses earlier in Genesis 18:33 we see that the LORD had been on the earth speaking to Abraham about destroying Sodom and Gomorrah. In the very next reference to the LORD, in Genesis 19:24, we see the LORD who had been speaking to Abraham rain judgment down from the LORD out of heaven. This is a strong indication of two persons acting in the judgement for Sodom and Gomorrah. What adds even more weight to this is that the same thing is repeated in Amos 4:11. In this text God is speaking in the first person (I) and He refers to (God) in the third person as the one who overthrew Sodom and Gomorrah. “I overthrew some of you, as when God overthrew Sodom and Gomorrah” There is clearly an effort by the Spirit of God with the inspiration of these texts to demonstrate the multi-personal nature of God. In the Shema itself, which every Jewish child has memorized from a young age, there is a hint to the tri-personal being of God. The Shema is the clear statement that Jews and Christians are monotheists. Within the Shema we have three referenced as being one. “Hear, O Israel: The Lord our God, the Lord is one.” Within the very text that unitarians quote all the time to deny the Trinity there is a hint to three in the Godhead. 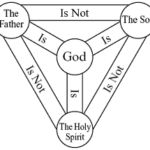 The interesting thing is that we as Trinitarian Christians quote Deut 6:4 all the time as well to demonstrate our belief that there is only one God. The Shema does not deny the doctrine of the Trinity it only confirms it further. In Isaiah’s vision of the LORD in the temple the seraphim were calling out Holy, Holy, Holy is the LORD of hosts. (And one called to another and said: “Holy, holy, holy is the Lord of hosts; the whole earth is full of his glory!”) The repetition of the word “Holy” has significance to us now in the New Testament when we now have further revelation that tells us that God is three in person. We also see the three uses of “Holy” in in the New Testament in Revelation 4:8. In Isaiah 48:16 we see the LORD again speaking in the first person and then refer to the LORD God as sending him and his Spirit. (Draw near to me, hear this: from the beginning I have not spoken in secret, from the time it came to be I have been there.” And now the Lord God has sent me, and his Spirit.) We can see all three members of the Trinity here, Father, Son and Spirit. The Son is the one sent by the LORD God (Father) and the Father also sends the Spirit. Psalm 2 is a very interesting passage of Scripture. It appears to be a dialogue between three individuals. It is a passage that is quoted numerous times in the New Testament as being messianic. I will highlight with color where it seems to be the different persons of the Trinity speaking to one another. There are many other passages in the Old Testament that could be used. These are a small sampling of the types and shadows that point to the deity of Christ and the triune nature of God. Thank you so much for this article and for your ministry! I really love your podcast and I love what you are doing for us, the church body! This article comes just in time for me as I am currently in the process of preparing to teach a class on the trinity. Thank you again brother and may the Lord bless you! Thanks much for your kind words. All praise and glory always goes to God. Glad that the truth of God is being taught and I have the privilege to assist. God bless brother.